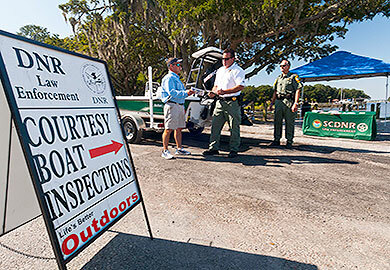 In an effort to keep state waterways safe during the upcoming Memorial Day holiday weekend, the S.C. Department of Natural Resources (DNR) Law Enforcement Division will again be conducting courtesy safety inspections at some public boat landings. The Memorial Day holiday weekend is one of the busiest weekends of the year on state waters. Ashley River - Herbert H. Jessen Landing - 9 a.m. to 11 a.m. - Dorchester Co.
Chechesse River - Lemon Island Landing (Edgar Glenn) - 9 a.m. to 11 a.m. - Beaufort Co.
ICW at Little River - Johnny Causey Landing - 10 a.m. to 12 p.m. - Horry Co.
ICW in Awendaw - George Garris Landing - 9 a.m. to 11 a.m. - Charleston Co.
Lake Bowen - Main Ramp - 11 a.m. to 1 p.m. - Spartanburg Co.
Lake Greenwood - Riverfork Public Landing - 10 a.m. to 12 p.m.- Laurens Co.
Lake Keowee - South Cove Park - 10 a.m. to 12 p.m. - Oconee Co.
Lake Marion - Alex Harvin - 10 a.m. to 12 p.m. - Clarendon Co.
Lake Murray - Billy Dreher Island - 10 a.m. to 12 p.m. - Newberry Co.
Lake Murray Dam - Lake Murray - 10 a.m. to 12 p.m. - Lexington Co.
Lake Robinson - Easterling Landing - 11 a.m. to 1 p.m. - Darlington Co.
Lake Thurmond - Parksville Boat Landing - 10 a.m. to 12 p.m. - McCormick Co.
Lake Wateree State Park Landing - Lake Wateree - 10 a.m. to 12 p.m. - Fairfield Co.
ICW south of Charleston Harbor - Wappoo Cut Landing - 9 a.m. to 11 a.m. - Charleston Co.
Lake Hartwell - River Forks Boat Ramp - 2 p.m. to 4 p.m. - Anderson Co.
Lake Moultrie - Richardson's Landing - 10 a.m. to 12 p.m. - Berkeley Co.
Lake Wateree - Clearwater Cove Landing - 2 p.m. to 4 p.m. - Kershaw Co.
Lake Wylie - Ebenezer Park Landing - 12 p.m. to 2 p.m. - York Co.
Mackay Creek - Pinckney Island Landing (C. C. Haigh, Jr.) - 10 a.m. to 12 p.m. - Beaufort Co.
Murrell's Inlet/Atlantic Ocean - Murrell's Inlet Landing - 10 a.m. to 12 p.m. - Georgetown Co.
Lake Greenwood - Greenwood State Park - 2 p.m. to 4 p.m.	- Greenwood Co.
Lake Keowee - Gap Hill Landing - 10 a.m. to 12 p.m. - Pickens Co.
Lake Murray - Lake Murray Dam - 10 a.m. to 12 p.m. - Lexington Co.
Lake Thurmond - Dorn Landing - 10 a.m. to 12 p.m. - McCormick Co.